Today I whipped up a “bapron” using this tutorial on Jess’s blog Craftiness is Not Optional. So easy and very popular when my pregnant friend Kimberlee unwrapped it tonight at dinner! 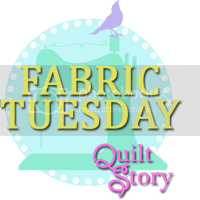 I’m linking up to Fabric Tuesday at Quiltstory – click on the button below to check out other people’s creations! This entry was posted in baby, bapron. awesome Bapron! love the decorative stitch you used! First time I have ever heard of one, but cool idea! I want to try one of these!! Great job! !